Recycle Earth - Burn Your Garbage !!! Nepal is a amazingly made a god gifted beautiful nation in south Asia, where are so many unbelievable imagine places. Nepal is the very watershed of Asia. Sand-witched between India and giant China. Nepal is a multi-religious, multi-lingual and a multi cultural country in south Asia, located on the lap of the Himalayas. it stretches from rich subtropical forest to soaring Himalayan peaks: from jungly tiger habitat to the precipitous hunting grounds of the snow leopard. Climbing the hillside of one valley alone you can be sweltering in the shade of a banana palm in the morning, and sheltering from a snowstorm in the afternoon. (In this following video as you can see three forefingers friends adventure across Nepal with the goal of Mt. Everest trekking the classic Annapurna Circuit and the Thorong-La Pass at an altitude of 5,416m whilst stopping by for a visit with an old friend on the way.) Watch them 30 Days of adventure in this 30 minute beautifully made HD long film.Three friends adventure across Nepal with the goal of trekking the classic Annapurna Circuit and the Thorong-La Pass at an altitude of 5,416m whilst stopping by for a visit with an old friend on the way. Watch 30 Days of adventure in this 30 minute long film. 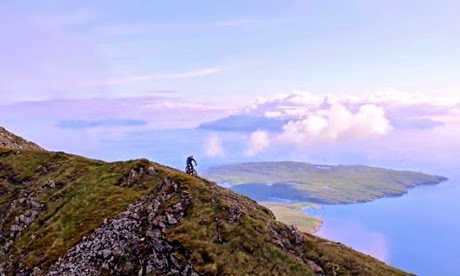 Danny MacAskill, the Scottish professional stunt rider and YouTube sensation, has released his latest death defying video – showing him cycling along the Cuillin Ridge on the Isle of Skye. The 28-year-old pulled off some impressive stunts on the 7.5-mile ride, which included the difficult-to-access summit of Sgurr Dearg. MacAskill and his filming company spent 10 days putting the film together, producing seven and a half minutes of stunning footage. If you have not watched any of MacAskill’s YouTube videos before, we can highly recommend ‘Way Back Home’, ‘Industrial Revolutions’, and ‘Imaginate’. And you can also watch him teaching our Peter Walker how to (sort of) bunny hop on a bike. Danny MacAskill’s stunt biking for beginners.